Welcome to Food Friday! This week’s PCOS Friendly recipe is Robin’s Energy Bites. Sometimes we just need a quick pick-me-up! These are delicious, powerful little morsels that will give you energy, your brain a quick boost and improve fat metabolism. They contain some unusual ingredients, but once you have them in your pantry you can use them in your shakes a well. It takes about 15 minutes to make these little bites of goodness. (Always use organic, fair-trade ingredients whenever possible). Place all ingredients in a food processor and blend for about 2-3 minutes or longer so that it begins to get soft and moist and well-blended to roll into balls. Use the MCT oil as needed to moisten… but not too much so begin with 1 tbls. Use the stevia to sweeten to taste. 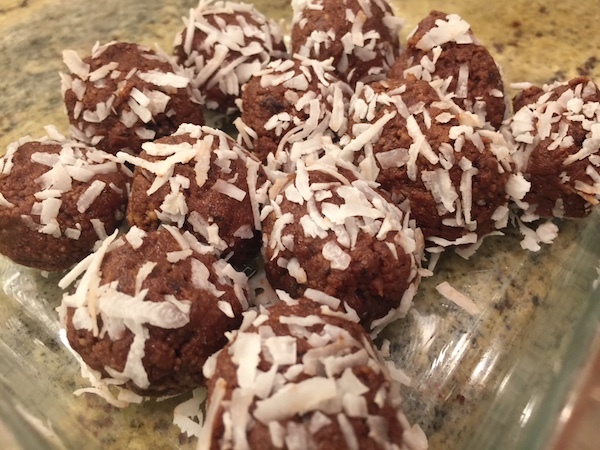 Roll into small balls and roll in the coconut flakes. Put in a container and keep in the refrigerator.